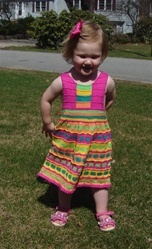 Bright Caribbean colors make a fabulous dress sure to be your little girl's favorite. Very simple fairisle and intarsia make this a great project to learn color work! Super 10 mercerized cotton is the perfect yarn, plus the green and orange buttons and an instructional DVD come with the pattern. Extra bonus: she'll be easy to spot in this dress! Please email us if you would like us to make up a kit for you.